Some people would have you believe that you aren't reading this. Because it's not 'above the fold'. Above the fold - a graphic design concept that refers to the location of an important news story or a visually appealing photograph on the upper half of the front page of a newspaper. But you are reading it, aren't you? Even if it goes even further down the page, way below the fold. I think I've made my point. We all know, people have learned to scroll. They did a long time ago, but still the 'everything needs to be above the fold' concept lingers on. • The fold is one of those guidelines that has been thrown about so much that it's now become a 'rule' of web design (or maybe more appropriately a 'ball and chain' of web design) with web designers blindly obeying without question. The ‘above the fold’ concept came from Newspapers, the aim being to put the most eye catching story or image on the folded over, most visible part of the paper, with an ULTIMATE goal of encouraging people to then buy the paper to read the rest of it. Web design adopted this idea, basing their integration of the concept upon the most common browser sizes. 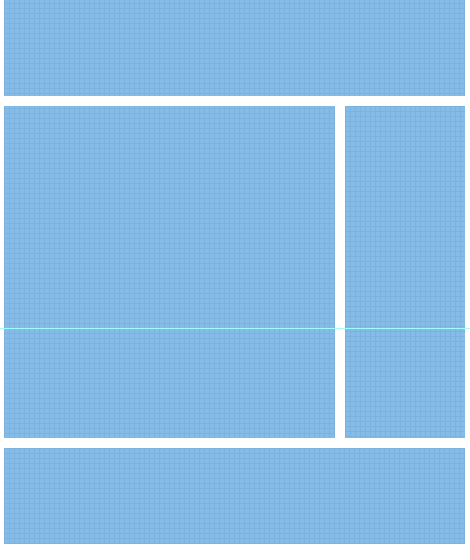 However, the digital fold concept evolved into ‘squash as much content as you can above a certain number of pixels’. This is wrong, wrong, wrong. Gone was the intent of putting your most eye catching content at the entrance point to entice your visitors to come in and explore the rest of the site. Now you were being pressured by ‘web design rule enforcers’ to sell everything on the front doorstep. Imagine a newspaper squashed all of its quality content on the front page. How disappointed would you be to open the paper to only find the leftovers? The same happens with your site. If everything of exceptional quality is pushed upon the reader at the beginning, once they start exploring and the rest of the site isn’t of the same calibre, they're going to be let down. The newspaper's goal is for you to actually read the newspaper, not just the front page. That should be your goal too. You want your visitors to explore your site/see your product or content. Don't let the statistic scaremongers bully you into thinking the visitor will decide in 3 seconds whether to stay or leave your website. Trust me, having no space and information overload will most definitely make your visitors leave before the 3 seconds are up. Guidelines have their place, but they should be viewed as only that. Guides! Web design is plagued by a long list of 'golden rules', such as 'never have more than 7 items in your main navigation' or 'Never, ever, ever use tables'. Garbage. What if you need a table? Think about the rules before obeying them! The classic example of giving the fold the finger has to be the 37 signals site. Look how hugely long and spaced out their homepage is! They tell a story as you scroll down, each section entices you, sells their product, builds desire. While there is a real wealth of information on this homepage, the user shouldn’t feel too overwhelmed. Everything has a bit of space and isn’t fighting for attention. Multiple entry points for their products are dotted throughout the story. They are clearly using the AIDA principle. Finally at the end of the page they give clear call to actions. They are thinking about the user’s next move and are telling them where to go. Think they could have squashed all of this above the fold and still achieved the same effect? What I'm proposing is for you to think twice about these ‘rules’ which are preached so often around the web and aim to create something original. Don't live in the old world of pushing all your quality content on the visitor at once because they've only got 4 seconds before their attention drops (or whatever other statistic is doing the rounds at present). Think about the ultimate journey you want them to take. Entice them in, make them actively want to scroll and read on, and on, and on. Guide them with your excellent content and let them explore your site. Tell a story with your content. Space it out a little and you will have some happy visitors who actually want to be there! So many sites have the same, big header, big fat call to action buttons, a sidebar, a big fat footer and the letterpress effect scattered about. Finding a bit of originality in the sea of sameyness is pretty difficult these days. Just put a bit of thought into creating quality content and presenting it in an interesting and readable way. This will make visitors stick around for a while and use that magic scroll button.